Gaza terrorists continued attacking southern Israel on Thursday, aiming mortar shells at Israeli soldiers on a routine patrol. 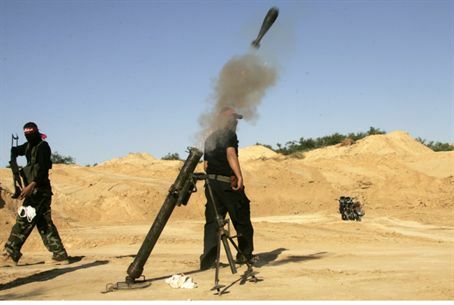 Gaza terrorists continued attacking southern Israel on Thursday, aiming at Israeli soldiers on a routine patrol. Two mortar shells were fired from northern Gaza by Palestinian Authority Arab terrorists at an IDF force patrolling along the security fence. No one was physically injured by the attacks, and no property damage was reported. Both shells exploded on the Gaza side of the fence, according to security sources. Last night Israeli soldiers and undercover Israel Security Agency (Shin Bet) operatives foiled a planned terror attack on southern Israel with an air strike in southern Gaza. Two Hamas-linked terrorists – Ashraf Saleh and Aris Abu Elenein – were killed in the operation. According to a statement issued by the IDF Spokesperson's Unit, Abu Elenein had also been involved in other terror attack attempts in recent years, including smuggling activities. He also directed terrorist activities in Judea and Samaria, the IDF said. Saleh was a past member of the Popular Resistance Committees terror group and was involved in weapons trafficking as well.